My colleague Patrick Waller has kindly reminded me that back in 2004 the journalist Norman Lebrecht issued one of his periodic Cassandra-like warnings about the parlous state of the classical recording industry. Towards the end of his piece, writing with typical restraint, he commented: “I shall miss the industry when it is gone …. I shall particularly regret the loss of comparability, our future inability to concretise Simon Rattle’s never-to-be-recorded Bruckner Fourth in the context of past masters.” Well, not only has the recording industry stubbornly refused to heed its own death knell, as sounded by Mr. Lebrecht, but it has now produced that “never-to-be-recorded” Rattle performance of that very symphony. 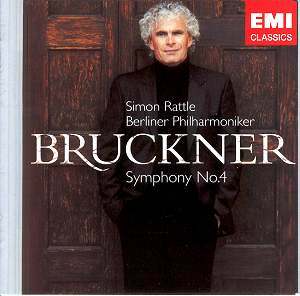 It’s not Rattle’s first excursion into Bruckner. I think I’m right in saying that he’s played the Ninth Symphony in concert and back in 1996 he made a recording of the Seventh Symphony for EMI with the CBSO (EMI 556425 2 – now deleted). I didn’t hear that recording, though if memory serves me correctly it was not as warmly received by the critics as were many of his other recordings from his Birmingham era. Now with his Berlin orchestra he’s made a live recording of the Fourth, possibly Bruckner’s most popular symphony. To be honest I find myself in two minds about this recording. It has much in its favour. For one thing the playing is superb: the strings have the warmth and richness that you’d expect from this source; the woodwind are eloquent and the brass golden and commanding. Also the recorded sound is very good. And though I have some reservations about Rattle’s interpretation what is presented here sounded to me to have the feel of a genuine performance – I couldn’t detect any audible evidence of takes spliced together - and the audience is commendably silent. Having commended the quality of the recording, however, I should warn that the dynamic range is extremely wide. Even when listening through headphones I found some of the pianissimo passages were very quiet indeed – and I know from personal experience at CBSO concerts that this is an effect that Rattle is perfectly capable of achieving without any help from the engineers – but be wary of adjusting the volume or the tuttis will frighten the horses. Having said all that, there are aspects of the interpretation that unsettled me. In fairness these tended to concern short isolated stretches of music but these occurrences did make me wonder if Rattle yet sees the music in long paragraphs, a quality which is vital to achieve success in Bruckner. One such instance crops up in the first movement. The opening is most atmospheric, with a glorious horn solo. The rustic second subject is also handled quite well. Then at 8:35 it’s as if Rattle gets a rush of blood to the head. For the next minute – to 9:39 – the pace he sets is hectic. I assume he’s aiming to generate excitement in the lead up to the climax that follows but I fear that more heat than light is generated. My yardstick recording is Karl Böhm’s 1973 Vienna Philharmonic version (Decca), also using the Nowak edition, and in this same passage Böhm is significantly more controlled yet there’s no shortage of energy or excitement. Rattle’s impetuosity here is a great shame for it mars what is otherwise a good account of the first movement. At 12:30, where the horn theme returns, decorated by the flute counter melody, the hushed playing is outstanding. This is a wonderful passage and Rattle and his superb players do it full justice. Then the build up to the final peroration is done very well, though I feel that Böhm reveals even more grandeur. The second movement is beautifully moulded by Rattle, who is aided by some super-fine playing from the BPO. I did wonder, however, if the moulding wasn’t just a little too beautiful. On its own terms the performance sounds convincing yet there’s an interesting contrast with Böhm, whose pacing is just a fraction swifter – he takes 15:28 for the movement against Rattle’s 16:38. Böhm just seems a little more natural in this music and you feel he’s taken a bit more notice of the last two words in Bruckner’s tempo marking of Andante quasi allegretto. However, no one could fail to be impressed by Rattle’s dynamic control in this movement, which culminates in a majestic climax at 14:29. If one is happy with the pacing – and the difference between Rattle and Böhm is not that great – then Rattle offers a good and consistent account of the movement. The hunting horn material in the scherzo is delivered magnificently. The music bounds along vivaciously and the BPO brass articulate superbly. I do feel, however, that the ländler trio is a bit on the leisurely side – in this section Böhm makes the music flow more easily at a slightly faster pace and in his hands the music sounds closer to Schubert. The finale begins very impressively. Rattle builds up to the triumphant reminiscence of the first movement’s horn motif very successfully, demonstrating vision and patience. For much of the time during this movement he leads the listener along very persuasively. There’s a reflective passage between 7:41 and 8:45 and here I wondered if he was loving and moulding the music just a bit too much for comfort. But, as in the first movement there’s a brief, disfiguring passage and I fear it strikes me as a serious lapse of taste. For just a few seconds at 10:12 Rattle gets the strings to dig into the music as if, for all the world, they’re playing Mahler’s Ninth. Not only that but these bars are taken at an incongruously slow speed. The effect is, frankly, grotesque and most un-Brucknerian. Later on, before the coda, I wrote in my listening notes “does finale really hang together?” I’m not entirely persuaded that it does, though this is a view that I may well modify – or confirm – with further listening. The build-up to the end (from 20:46) is full of suspense and is very well realised. The symphony concludes in a triumphant blaze and I felt that the last bars were more of a release than usual – a comment that is definitely meant as a compliment. So, as I said, there’s a good deal to commend this recording but there are reservations too. This is the first time that I’ve heard Rattle in Bruckner and my overall reaction is that his Bruckner is “work in progress”. I wonder how often he’d performed this symphony prior to these concerts; perhaps the piece needs to gestate and settle in his mind a bit more? In some ways I wish he’d waited a few years before making this recording for the combination of his great gifts as a conductor and the fabulous orchestra at his disposal could produce a very fine recording of the Bruckner Fourth. We’re not quite there yet, though.